Sony announced today that the Playstation Network store will be getting an additional venue outside of your Playstation: Amazon. 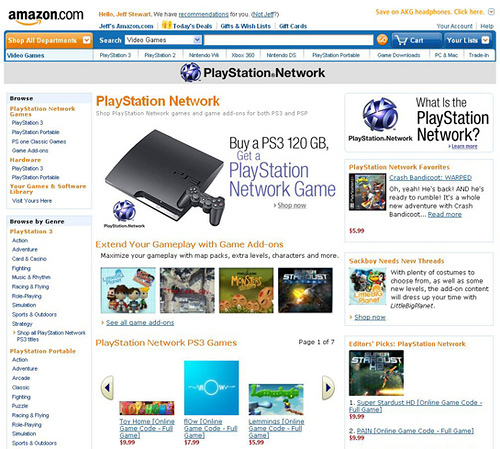 Eric Lempel, the director of PSN Operations, posted on the Playstation Blog that codes to download games and add-on game content can be purchased for both the Playstation and the PSP via the new Playstation Network hub on Amazon. The Playstation Network and the PSP have their fair share of co-op titles, and if you're not sure which ones to pick up, check out our games' database for both platforms to see details about the kind of co-op offered, related co-op news, and reviews from the Co-Optimus Staff and members for all of the games listed. You can also help support your favorite co-op site by following this link to the store! Page created in 0.6158 seconds.